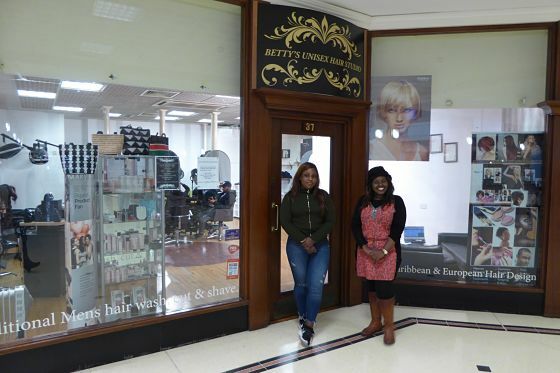 Together, Elizabeth and her daughter, Sandra run the salon, based in Vicarage Field Shopping Centre, offering expertise in African, Caribbean, Asian and European hair, as well as hair and beauty products, and good quality wigs from Kenya and Brazil. We spoke to Elizabeth about her start-up journey and the support she received from the London Small Business Centre. It’s a mother and daughter business, with a friendly, family atmosphere. I have over twenty years’ hairdressing experience, and I passed on my passion for hair to my daughter, Sandra. Having always worked with hair, even when I was a child, I first opened a salon in Kenya in 1994 and grew the business until I was employing eight members of staff and considered some of the country’s elite as my regular customers. I moved to the UK in 2001 and went mobile, while also attending a hairdressing college to improve my knowledge and learn new skills and techniques. Despite also working for others, and having a child along the way, I never lost sight of my dream to, once again run my own salon – this time with Sandra. I work as a team with my daughter, and I want everyone working with me to feel they are part of the team and the business. That’s why I don’t rent out chairs but employ staff instead. I don’t want people to fight for customers; I want everyone to focus on being friendly to customers. It’s an ethos which is paying off. We endeavour to make every customer feel special, ensuring they not only return, but bring their friends and family too. We are currently gaining around five new clients every week. The search to find the perfect salon took almost three years. Finding the finance to start-up was also an obstacle, until I found the London Small Business Centre and Business Advisor, Lana Hersak who supported me with my successful application for a Start Up Loan. There are other challenges, such as ensuring the business complies with all regulations, taxes, marketing, finance, and the visibility of the salon is an ongoing challenge – but we are learning all the time. What has the impact of the support from London Small Business Centre been? The Start Up Loan helped me open my salon and it’s reassuring to know there is support there at the London Small Business Centre if I need it. I couldn’t make it without their support. The team from the London Small Business Centre are so supportive. They don’t kill peoples’ dreams. They don’t just help people to access finance; they also follow up with them. If they hadn’t helped me apply for the loan, I would not have realised my dream. With LSBC, there is someone to help me and support me on my journey. I feel very lucky that I am so supported. What has been the highlight of setting up Betty’s Unisex Hair Salon? I am so happy my daughter is working for me. We do things together and we are closer than ever before. In the salon, Sandra can build her own future. We both now do what we love, and while it’s hard work – it’s very rewarding.